I may be a bit late on the Instagram train, but better late than never right? Actually, I have had my Instagram account for a few years but never really embraced the whole "Instagram culture" - let me tell you, I am hooked. Ever since I installed the Instagram app on my IPAD it has been a hundred times easier capturing images throughout the day. If you know me well, you all ready know that I am one of those people that very rarely answers their cell phone, you are more likely to get me on Facebook chat than on my actual phone....I also turned off texting, like 5 years ago - I am not a huge fan of the phone. The IPAD has made Instagram far more accessible & fun to use. I love taking random photos throughout the day without having to find my phone or lug around a camera - so easy and I really like easy. So the point of this rambling paragraph you ask? I am starting a new Friday Series to round out the week called ; weekly life through Instagram eyes. I for one, am always curious about everyone's day to day life and wanted to share bits and pieces of my life throughout the week with you as captured through Instagram. For day by day, hour by hour coverage you can also follow me on Instagram...be warned I am a little bit of a crazy cat lady but there are also tons of foodie pics too! I cannot begin to tell you the heartache associated with these donuts ; much like the brownie fiasco of 2013 this recipe took multiple times to get just right...like so many times that Justin sighed and grumbled every time he asked me "whatcha baking" and I replied "...donuts". Now don't get me wrong, he loved the first two times I whipped up a batch, however I probably have made at least 6 batches of donuts within the past 2 months. 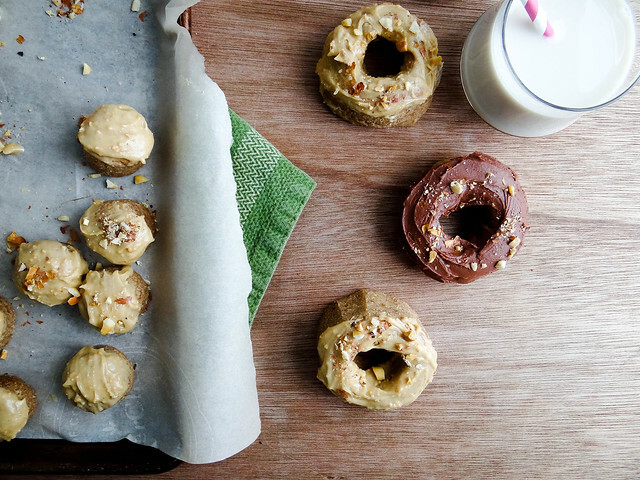 Let me share with you what I have learned on this doughnut making adventure. 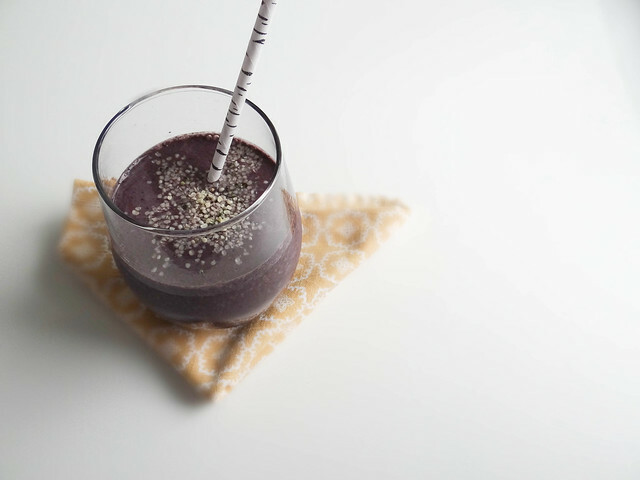 Lately I have been craving smoothies in the worst way - smoothies are incredibly easy to throw together and super versatile. The flavor combinations are really endless, yesterday morning I made Justin a Chocolate Peanut Butter Banana Smoothie; Chocolate PB, bananas & h2o - that's it and it was delicious! Doesn't get any easier than 3 ingredients. I haven't made Anna puppy treats in forever- the spoiled pup she is receives a bark box once a month filled with toys and treats galore. However, I found myself with nothing to do on a lazy Tuesday afternoon with a wilted bunch of parsley - mostly dried half alive, it wasn't looking to good for the parsley. Knowing that it needed to be used right away I figured I'd treat Anna to some homemade goodness. 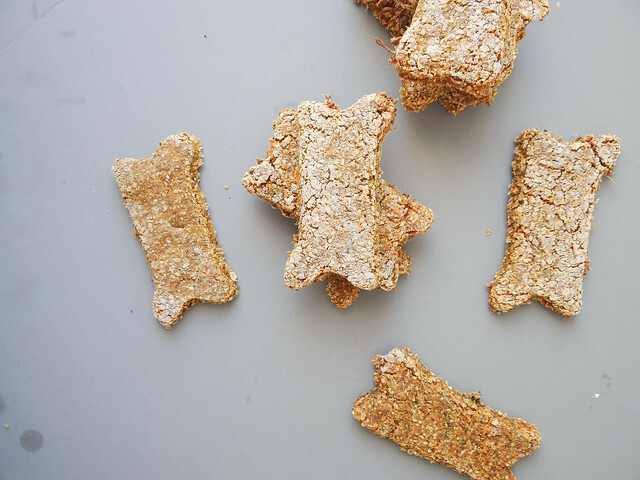 These treats are incredibly easy to make with common pantry & fridge items that I am certain most of you always have on hand- they have the added benefit of being lower in calories and full of goodness for the pup in your life. I kid you not, I ate this salad every single day the week I made it. This is so not a Justin Salad - way too green for his liking plus he is a strong believer that fruit (including dried cranberries) does not belong in salads, stuffing or anything savory for that matter. Considering this salad features 2 dried fruits I was prepared from the get go that I would be sole consumer of this amazingly simple yet super tasty salad- which lucky for me, tastes even better throughout the week. Weekday breakfast at work is either super foods oatmeal that I make myself or an English muffin with peanut butter. Weekend breakfast consists of breakfast sammies or pancakes. 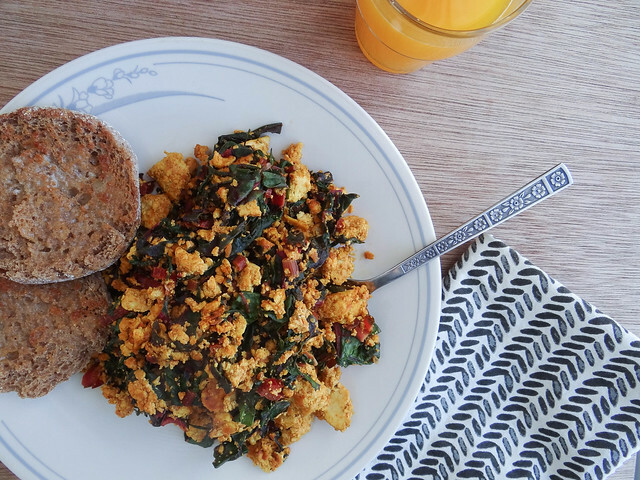 Any weekday I have off from work you are guaranteed to find me with a big ol' plate of tofu scramble. I drink copious amounts of tea and always have at least 4 books in my kindle Que that are just waiting to be read. Come to my house or work on any given day and you will be guaranteed to check anyone of these items off - maybe it is my type A personality, but often times I am pretty predictable which isn't necessarily a negative trait, I do find time for spontaneity too! 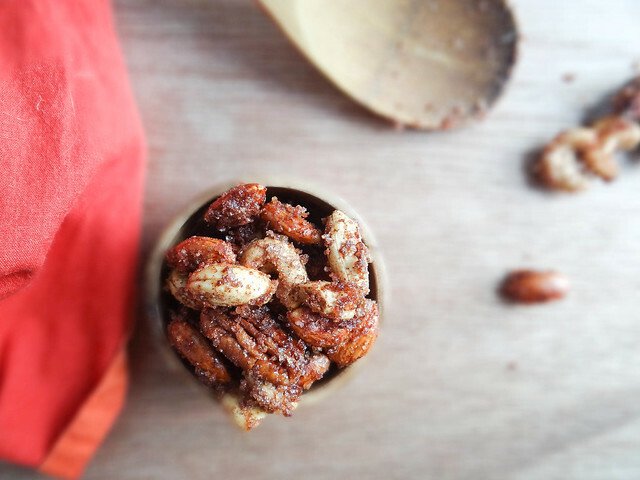 Let me just tell you, these maple cinnamon mixed nuts are absolutely freakin' delicious and addicting. So dangerous that I give most of the nuts away any time I bake up a batch, if I didn't I'd be apt to inhale an entire jar within a day. Incredibly easy to make, they make an awesome hostess or I like you gift.